Blogger is best blogging platform for any bloggers that provides many features for SEO purpose. These features of Blogger are setting custom redirect, custom permalink for old url and adding search preferences for dealing with SEO. I was reading more on search preference like what if some one change url and set new url for post . I read and thought what If I change old url to new url then the traffic I’m getting for post will be directed to the page with 404 error instead of to post that means my readers are not getting what queries they are looking for . So now question arose ” how to get the traffic back to post which is directed to 404 error page ? ” . 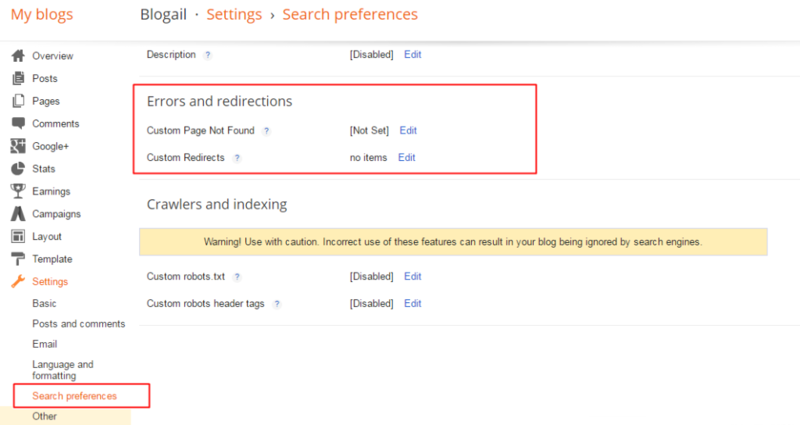 For avoiding broken links and reducing 404 page you need to set custom redirect for your posts in blogger. Lets learn ” how to redirect old url to new custom url in blogger ? 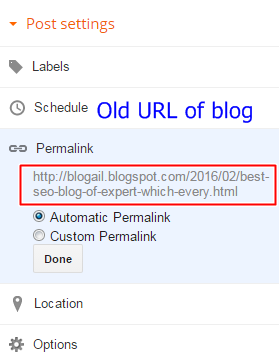 Why should you redirect old URL to new URL in blogger? When you publish a post search engine (like Google , Bing and Yahoo ) index it in some time automatically and your posts started showing in search results. Once Your post is indexed You started getting organic traffic from search engine. But what if you need to change url of that post for some reason. Like you, I also update my posts with time and also change url if I think change is needed. When you update url then as said search engine takes time to index or re-index your blog. After Updating : Page does not exits or 404 error page not found displayed. Till search engine re-index your updated blog , traffic that you were getting for blog will be redirected to a page with 404 error that mean loss of readers. So , To get that readers back to your blog you need to reduce 404 error page and also a broken links. Avoiding 404 error page is not necessary for seo and google although you have to reduce the 404 page. Avoiding 404 pages and broken links on blog is essential for those bloggers who are getting traffic from search engine and also for those bloggers whose blog has so many backlinks. You can only reduce 404 pages and broken links by custom redirect feature of blogger. Custom redirect feature not only redirect your readers to original post but also helps in passing link juice to your own blog not to error page. 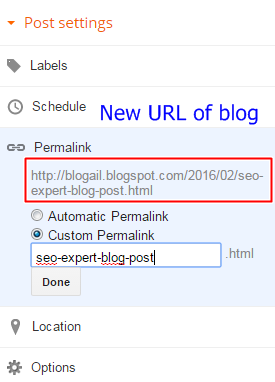 How to redirect old URL to new URL in blogspot ? Now you know that ” why custom redirect is essential for seo ” and ” how redirecting old url to new url ” can help you in getting lost traffic and link juice. Lets redirect your old url to new url. Step 1 : Login to your blogger account and go to this path Blogger Dashboard => Setting => search preferences. Step 2 : In ” Error and Redirections ” , click ” Edit ” button for custom redirect. Step 3 : Click on “New Redirect ” , You will see option ” From ” and ” To “. Blogger provided you this feature to set custom redirect for your post. So what you need to do is to place your old url in ” From ” option and new url in ” To ” option. Note : You do not need to enter full blog url in the both ” From ” and ” To ” option. Just enter url and leave the Domain name. Step 4 : When you entered url in the both ” From ” and ” To ” option , click ” Permanent ” and ” Save changes ” button. I’m sure that you have redirected old url to new url successfully. Now when you’re custom redirected old url to new url, your blog readers will not see 404 error page and you will also not loss any readers and traffic. If you still have any queries then let me know below in comment. ← How To Get Your Facebook Page/Profile Verified ? okay..thanks for clearing my doubt.By the way you should write a post how to host your blog on wordpress or any other CMS site .That would be really helpful. I was just experimenting with url stuff in my old blogger blog and I guess what this article came in very handy. Nice but definitely believe that wordpress can help with this. This is only meta refresh. How to 301 redirect from blogspot to another website. This is really a good practice to use this redirection feature in blogspot. By this way, you can use subdomains for your landing pages too. Thanks for the share Ravinder.